Flags fly outside the Navistar Proving Grounds in New Carlisle, Indiana, U.S., October 12, 2016. MONTERREY, Mexico - Less than half the trucks exported from Navistar’s mammoth Escobedo plant in Mexico are sold in North America but the factory’s success remains tightly tied to the uncertain future of the region’s NAFTA free trade deal. Navistar’s Mexican factory, now the U.S. company’s largest worldwide, exports to around 30 countries and sells less to the United States than competitors such as Daimler AG, one of the top three truck-makers in Mexico, which sends three-quarters of its Mexican-made commercial vehicles north. But Navistar’s reliance on tariff-free imported parts shows why even Mexico manufacturers that have diversified their customer base away from the United States still fear U.S. President Donald Trump’s threats to scrap NAFTA. “To lose this treaty would be to go backwards 40 years,” said Oscar Ruiz, operations director at the plant, fearing a return to an era when barriers made foreign investment and trade expensive between the two neighbors. Trade negotiators from the United States, Mexico and Canada will meet this week in Washington for a fourth round of talks on reworking NAFTA amid growing signs of an impasse between the Trump administration and the other two signatories of the pact. Mexican officials warn that Trump is leading the region towards a protectionist trade war with his “America First” policy, flirting with major curbs on commerce. Nowadays, over half the original parts for the vehicles made at Navistar’s 250 acre (100 hectare) site in the northern state of Nuevo Leon arrive duty-free from the United States and Canada in hundreds of trailers every day, Ruiz said. Higher tariffs on imports or reduced trade flows would raise the cost of production and of exporting to the United States. That would make trucks more expensive for all Navistar’s customers, experts consulted by Reuters said. Navistar, for example, uses Alabama-made Cummins engines in its International Prostar and LT heavy tractors. Without NAFTA, importing the engines would likely cost 10 percent more, based on World Trade Organization tariffs, according to Manuel Nieblas, a manufacturing consultant at Deloitte Mexico. With engines representing up to 45 percent of the $130,000 cost of a Prostar truck, that tariff alone could add around $5,800 to the final price. Prices would also rise for most of the up-to 12,000 parts used in a Navistar truck, both due to the tariffs and slower border-customs checks if trade were to be more regulated. Aside from higher prices for imported parts, ending NAFTA would likely impose a 4 percent tariff on top of the total value of the Class 8 truck 18-wheeler for export to the United States. Still, that might be slight enough for U.S. consumers to absorb, or for the company to shave off its margins. And Navistar’s strategy of using Mexico’s low costs and multiple free trade deals to export to markets from Saudi Arabia to Australia could soften the blow of any tougher export rules for the United States, Mexican Chief Executive Carlos Pardo said. “More than ever I believe Mexico is a logistic springboard, where on top of a qualified work force and reasonable production costs, logistically it has created the connections to supply any part of the world,” Pardo said in Navistar’s Mexico City headquarters. While 98 percent of trucks exported from Mexico go to the United States or Canada, U.S. truckmaker Kenworth, China’s Giant and Korean automaker Kia all have a similar strategy of building in Mexico to export to countries other than the United States. Scrapping NAFTA might not hurt exports to robust European economies, but those to Latin America, Navistar’s top market after North America, would become much more complicated, said Salvador Pasquel, an automotive expert at Baker McKenzie. Business with Colombia, which in 2011 was the biggest market in Latin America for U.S. truck companies after Mexico, helps illustrate what could happen if NAFTA collapses. Sales plummeted after vehicles got more expensive because of changes in Colombia’s trade policy, including a tax of 15 percent on the value of new imported heavy trucks. “We went from exporting $817 million in heavy tractors in 2011 to barely $1 million in 2015,” said Miguel Elizalde, president of Mexico’s truck and bus business chamber, Anpact. One fear for Mexico-based companies is that increased costs there would boost Latin American sales of trucks made in Brazil, whose vehicle industry belongs to the Mercosur free trade bloc. “If it’s harder for Mexico to place its products in Latin America, the big economy that could provide those cars and trucks would surely be Brazil,” said Baker McKenzie’s Pasquel. The worries over NAFTA coincide with a recovery in Navistar’s U.S. market. After a long stretch of depressed sales, orders for Class 8 trucks in the United States soared for the fourth consecutive month in September, according to preliminary data from industry forecaster FTR. Analysts expect a strong year in 2018. 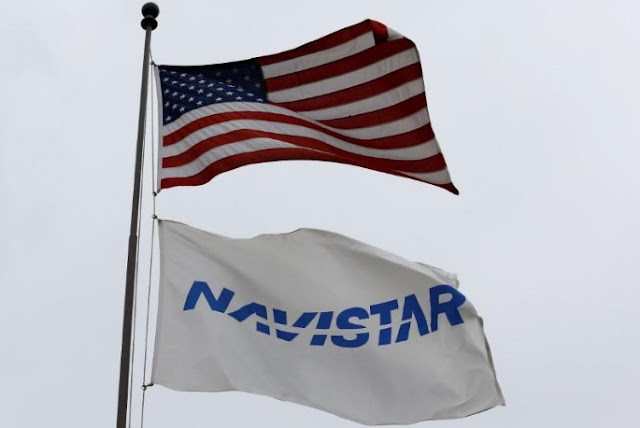 Although Lisle, Illinois-based Navistar posted a second quarter loss, its share price has recovered lately as the company turns itself around after a disastrous bet on a costly and unsuccessful smog-reduction system. Last year, Volkswagen’s truck unit said it was buying a stake in Navistar as part of an alliance in which the two companies will share technology. In Mexico, growth of truck-making under NAFTA has been rapid. In 1993, a year before the deal took effect, Mexico exported 1,040 heavy vehicles. Last year, it sold 106,161 such vehicles abroad, according to Anpact figures. Navistar’s Escobedo plant was producing three vehicles a day when it opened in 1998. It now makes 160, with capacity for almost double that, factory manager Ruiz said. The company is under no illusion it could maintain those volumes without NAFTA, though the plant recently decided to hire 150 new workers because of recovering U.S. demand. “We could survive, yes, but the question is, at what level?” Ruiz said. Less than half the trucks exported from Navistar’s mammoth Escobedo plant in Mexico are sold in North America but the factory’s success remains tightly tied to the uncertain future of the region’s NAFTA free trade deal.